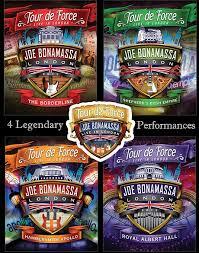 Coming soon is the new box set from Joe Bonamassa “Tour De Force.” Four nights and four shows of material. I worked along side Kevin “Caveman” Shirley on this amazing project and am very proud to have been a part of such a historic undertaking. It was a lot of working assembling and editing the shows and I also got to sit in on some of the video editing which was a great experience. Check out jbonamassa.com to order your copy.